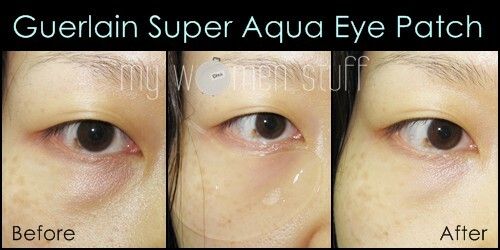 Home » Product Reviews » Guerlain Super Aqua Anti Puffiness Smoothing Eye Patch – Eye bags begone! 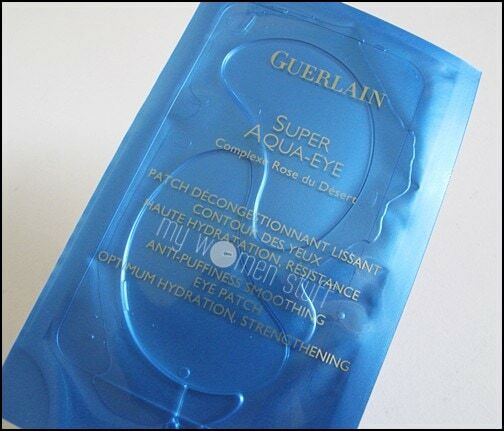 Guerlain Super Aqua Anti Puffiness Smoothing Eye Patch – Eye bags begone! Here’s a set of eye patches I’ve been trying out. I mean I like my bags, but heck no! Not under my eyes! These eye patches are part of Guerlain’s Super Aqua range and are said to be “anti-puffiness smoothing eye patches”. “Anti-puffiness” That’s a good thing! Now how does it fare? Each set of gel patches comes sealed in individual blue sachets. When you open it (from bottom left corner – don’t try to rip it apart as I did 😛 ) you will see 2 large pieces of gel patches. They are slippery and it takes some doing to peel them off the plastic sheet they are on. Because they are slippery, once you slap them on your face, they do have a tendency to slip a little so my advise is NOT to be like me and think you can wear these and walk around the house, but put these on and lie back to rest. Place the eye patch on the lower eye area and put it as close to your lashline as possible. It is surprisingly large (or maybe my eye area is small) so it covers a very large area of my under eye area up till my cheekbones. The picture above says it all right? Huge ugly red puffy eye bags before and much reduced redness and less puffiness after. Heck I was ready to slam this for an expensive experiment but I have to grudgingly admit that it is an expensive experiment that works. The best part is that it remained less puffy for about 4 days before my hectic lifestyle took its toll. You are recommended to use this twice a week. If I were rolling in it, I would but because I’m not, I’m saving this for when I can no longer bear the sight of my eye bags – or when I have to look alive quickly. So what’s the damage to the pocket? Are you sitting down? RM361 for a box of 6 pairs of eye patches. That’s right. Time to pick your jaw off the floor and dust it off. If you have an eye bag problem, you’d realize that with eye bags, you tend to look tired and sleepy, which may not inspire confidence. In my case, as mine are due to insufficient sleep, the only true cure is lots of sleep. Once I’ve had a good night’s rest, my eye bags go away. But in those times when I need a quick cure, finding a quick short term solution is helpful. Guerlain Super Aqua Anti-Puffiness Smoothing Eye Patch retails at RM361 for a box of 6 pairs at all Guerlain counters. I think I just lost my jaw to the floor. *picks up Jessica’s jaw, dusts it off and hands it back* Sorry Jess, found it under the chair! wow expensive stuff!!! my friend swears by the one by SKII, well just as expensive i think. i will stick back to my normal eye-cream for now. Eye creams don’t help me unfortunately, but an inexpensive method would be a cool spoon – gives similar results. Glad that it works for you, Paris, me, ima investing in less gaming and more concealers, wakakaka. Thank God i’m not an eyebag person, but a dark circle one. Haha… I’m in bed latest by 11pm else its eye bags galore! yeah yeah, I’m burning midnight oil for the football also…. whoa, its really an eye-opening price!! haha…don’t think I have the luck to try on this. I go for the cheaper way… a cold tablespoon and a cup of unsweetened black coffee. the price, ouchies! but it really worked on u PB. how long does the effect last, me wonder…. I can see a HUGE difference, WOW!! It’s not THAT expensive if you compare it to prices of eye treatments these days. And since they do work….it’s worth it, I say. I need something to magically erase dark eye rings in 15 minutes, that’s what! Oh my oh my oh my. I have really bad dark circles and the worst eyebags amongst anyone I know which I’ve had for years and have never diminished regardless of me sleeping early and all that. Am looking for good eyecream recommendations though. Know any? wow, the results are amazing! It worked so well for you and it’s good to know the results last a few days too. But ouch, this stuff is super expensive!